Besides its two Pontiac GTO.Rs, TRG will enter four Porsches in the Rolex 24 – matching the six TRG GT entries that ran in the race last year. Two of the cars will be new 997s, the other two being 996s. Sadly, we have to report that Dave Master, who finished eighth in class last year, in the #63 TRG Porsche, suffered a heart attack and died on December 12 – but the #67 car will carry his name throughout the month of January. He had been planning to race in the Rolex 24 again. The four best placed TRG Porsches last year finished third, fifth, seventh and eighth in the GT Class: from the look of the line-up in #66 this year, Kevin Buckler is out to win the class again…. 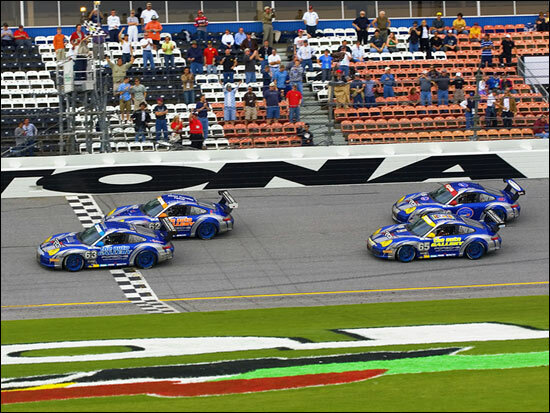 “The 66 car is carrying our lead number by tradition,” said the team owner (#66 was the winning number, overall, in 2003). “This has to be one of the strongest line-ups in the field. My friend Steve Johnson and I talked about what it would take to win this event and we agreed to get it done. Steve drove really well last year and is very fast at Daytona - add in three more pros like Robert, Stephane and Cyrille and this is one strong program. As a little added insurance we assigned the 66 number to this car. That number has done pretty well here so I hope to continue the tradition. Everyone is very excited. Steve Johnson and Robert Nearn will run in the full Rolex GT series in 2006.